Ordaining Bishop Bridget Mary Meehan (C) presents Rosemarie Smead (R), a 70-year-old Kentucky woman, to the audience after she was ordained as a Roman Catholic priest during a Celebration of Ordination at St. Andrew's United Church of Christ in Louisville, Kentucky April 27, 2013. A dissident Roman Catholic group ordained a 70-year-old woman a priest in Louisville, Kentucky, during a ceremony attended by hundreds on Saturday. 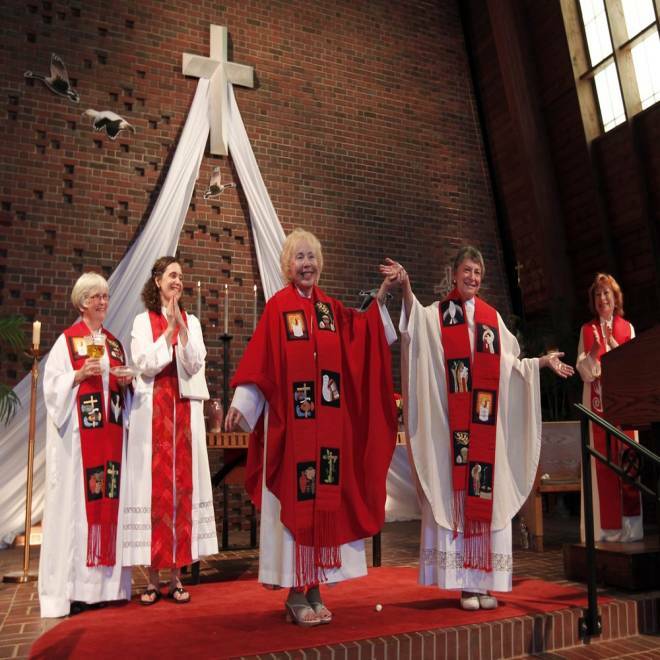 About 150 women from all over the world have been ordained in defiance of the Roman Catholic Church that bans them from becoming priests. Rosemarie Smead will be starting her own congregation and she told Reuters she is not worried about being excommunicated. "It is a medieval bullying stick the bishops used to keep control over people and to keep the voices of women silent,” she said. “I am way beyond letting octogenarian men tell us how to live our lives." Smead, a former Carmelite nun with a bachelor's in theology and a doctorate in counseling psychology, wept throughout the ceremony. According to a recent New York Times/CBS News poll, seventy percent of U.S. Catholics believe women should be allowed to be priests. In a statement last week, Louisville Archbishop Joseph E. Kurtz called the planned ceremony by the Association of Roman Catholic Women Priests a "simulated ordination" in opposition to Catholic teaching. "The simulation of a sacrament carries very serious penal sanctions in Church law, and Catholics should not support or participate in Saturday's event," Kurtz said.